I am so sad that the Olympics are over. Seriously. Sad. I love the Olympics. I love competition. I love the back stories. I love the pride that comes with competing for your country. I think the Olympics are so special. I will always love them. I will always think they are spectacular. The highlight moment for me was watching Keri Walsh-Jennings and Misty May-Treanor win their third (and final) olympic gold medal. I teared up a little when they were giving their post-win interview on the side of the court. It was so special. I got to see them live when they came to Austin on tour back in 2004. I have followed them ever since. Another top highlight for me was watching Michael Phelps. I just love him. I think he is such a talented athlete and I was rooting for him to make history. I am so glad he did. I can not image how it must feel to be the world’s most successful Olympian OF.ALL.TIME. 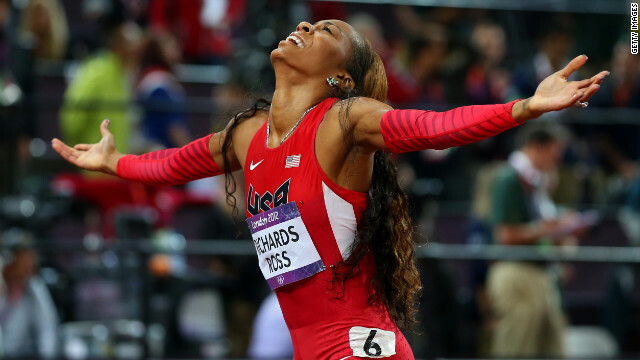 I was also excited to see Sandra Richards-Ross to win the 400 meter dash. Isn’t her reaction priceless? I can’t imagine what being the best in the world in one event would feel like. She waited four years for this moment after taking silver in Beijing. I can only imagine that I would react as she did. And let’s not forget the first Saudi Arabian woman who competed. She may not have won, but she was there. That is huge. HUGE. I was proud for her. As a woman, I was happy. What a step forward for that country! I’m sad. Really sad. If I was an Olympian I think I would be a little depressed. It’s over and now we have another four years to wait. Sigh. What was the highlight of the Olympics for you? Every time the damn gymnastics comes on, I’m like a waterworks. I cannot stop crying! I wasn’t that into gymnastics that much this year. I feel like I really liked gymnastics when I was a kid and now as an adult it doesn’t appeal to me as much. I loved the Olympics too, such an emotional event! I think London did well! 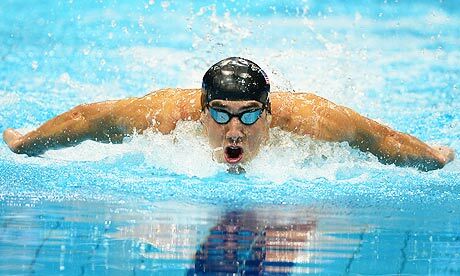 I enjoed Phelps performances too a lot! The women’s 4 x 100m & 4 x 400m … good lord those women are FAST! Allyson Felix’s win. The men’s 4 x 100m. Yeah Jamaica took it but we kept it close. Closer than I thought it would be, especially with Bolt as the anchor. And Rupp’s killer kick in the 10k to end up with the silver. I had chills watching that one. A bit T&F obsessed this year, I think haha. Haha, I love how much you love the Olympics! I am pretty much obsessed with all sporting events so the Olympics are like crack to me! I even scared my dog a few times because I was screaming so loud for Michael Phelps! Ha! I am sad too Kelly! But man am I excited to actually be in bed before 10 again! I’ve been dragging for the last couple weeks! I loved watching the interview with Walsh and May. I was bawling…. haha I am so emotional though! Nate was giving me so much heck, but watching the emotion on Walsh’s face. She couldn’t even talk! ahh sooooo inspiring. I can’t believe they’re over already!! They were fun to watch and especially inspiring…gymnastics, swimming, and running events were my favorite to watch. I LOVED watching the Olympics too. This year was even more exciting for me, as I will be attending the Paralympics in London in two weeks. It was neat watching the Olympics knowing I will be there at those same venues, watching super human athletes compete. How cool!!!! That is so exciting!!! The beach volleyball was my fav! The rhythmic gymnastics I didn’t get…I’m sad too but agree that at least there’s football! I loved watching the girls win the gymnastics and then Gabby winning. I also loved the look on Carmelita Jones’ face when the 4×100 broke the world record. Of course my favorite part was probably David Boudia winning gold for Purdue, I mean the US. I didn’t know the outcome to it (or any of the events, hooray for not having a smart phone! ), so it was so exciting to watch!